Did you know that for most solopreneur websites, the “about me” page is one of the most-visited pages? Mine is consistently the third most popular page, after my homepage and blog. It’s way more popular than my “Work With Me” page. The odds are, it’s the same for your website as well. People want to know about you before they even consider working with you. Is your about page just a bio, or is it moving them to make a purchase? 2) They got really into the writing process and ended up writing a long, winding story about their life, their struggles, their kids, and their neighbor’s grandma. If you never know what to say, I’m about to spell out exactly what your about page should include. And don’t worry—it’s actually not all talking about yourself! Here’s how to write an about page that not only tells a compelling story, but also help you win new customers. Why do you do what you do? What drives you to get out of bed every morning and grow your business? You might say it’s just for profit. But come on—you could be making a profit by working for someone else’s company, selling all your belongings on ebay, or playing with the stock market. Why do you run this business? At the end of the day, your product or service is basically the same as every other product or service out there. You might differentiate yourself through low prices, exceptional customer care, or fancy features, but what’s going to actually motivate someone to buy from you over someone else? One of your strongest differentiators is what you stand for. Tell your readers why you’re here. Make a bold statement. When you let your customer into your head, when they get to understand your motivations and how you think, they’re going to be way more inclined to trust you. Who is your customer? Are they defined to the point where you can picture their face in your mind? Do you know what keeps them up at night, how they feel about their job, and what their home life is like? You’ve heard how important niche’ing is, and this is exactly why. You need to know your ideal customer in order to talk to them, to acknowledge their fears and pain points, and then to propose your solution. I’ll be the first to say that family photos are hard to get just right. Maybe you’ve been trying for years to get that holiday card money shot where everyone is actually smiling. Or maybe you’ve just accepted that someone is going to end up with a wrinkled shirt. But don’t sweat it. I’ve photographed the squirmiest toddlers, the kids who would prefer making any face at the camera but a happy one, and the babies that never seem to stop crying. The perfect moment might only last for half a second, but you can be sure I’ll capture it. The first paragraph describes a negative situation the customer might be experiencing. Then the second one addresses exactly how the photographer will get the customer out of that situation. This kind of specificity makes the reader instantly think, “Hey, that’s me!” and they’ll know that you understand their problems. 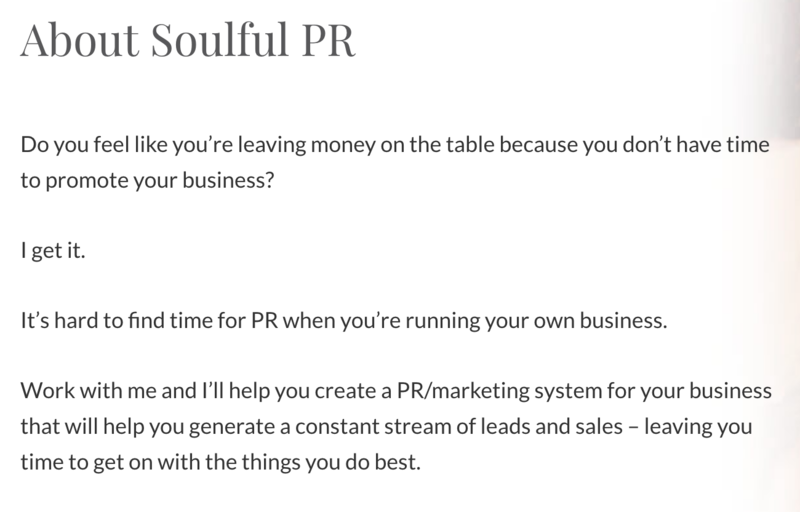 Once your reader is engrossed with your “why” and feels like you understand their personal situation, you have the freedom to tell them about yourself and/or your brand. When telling a story, it’s tempting to follow the traditional story structure you learned in high school: start at the beginning, describe each struggle, hit the peak of conflict, then show how everything was resolved. That story structure is effective. However, in web copy, it can also be far too long. Instead of telling the story A to Z, it’s almost always best to focus in on just the most important parts. For example, instead of a page-long, play-by-play description of your life story, what if you used bullet points? …Did the soul work to identify my next step, and took it. …Used those same principles to find and marry John, the love of my life. …Switched careers into a job I find meaningful every day. This communicates everything your reader needs to know while respecting their time and keeping them focused on your main message. Does every story have to be that short? Of course not! That’s just a best practice. However, if you’re going to go longer, I challenge you to present your story more creatively. For example, take Ash Ambirge of The Middle Finger Project, who went from living out of her car with a ton of debt to being a crazy-successful entrepreneur who travels the world. Her brand is all about empowering others to change their lives through business. Great story, right? She could write a memoir, easily. But on her website, she keeps her life story simple. 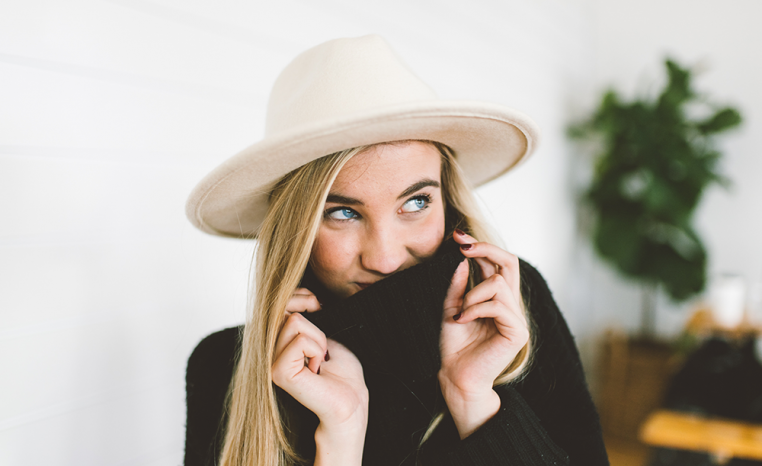 Instead of a wall of text, her About page directs readers to a blog post called “The 67 Emotions of My Online Success Story,” and includes a list of the most interesting facts of her life. It’s a longer story, but it’s presented in such an interesting way that you can’t help but keep reading. A story is not inherently engaging. You have to MAKE it engaging. And most often, that means focusing on the most impactful parts. Not sure whether or not to include a certain story? Does the story demonstrate a claim your making? Does it make a concept easier to understand? Will the reader learn something? Keep every story in the context of the reader. What will they gain from reading it? If you can’t answer that, don’t include it. Tip: Do you feel awkward talking about yourself? I’ve created a free About Page Prompts Worksheet to help you easily pull out the key pieces of your personal history and find new things to talk about. Get the About Page Prompts worksheet sent straight to your inbox! 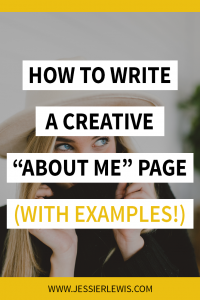 Remember, your about me page isn’t just about information—it’s about encouraging the reader to take an action, to take a step deeper with you. I encounter a lot of new business owners who are scared to share a photo of themselves on their website. Sometimes, it’s a confidence thing. Others feel like the photos they have aren’t professional enough. But here’s the deal: You need a photo. Straight out. If you don’t have a good one to use, find a local photographer and ask about their headshot packages. Even better, get some wide-angle shots of you in interesting locations that you can use as headers throughout your website. If you are your business (think freelancers, consultants, coaches, bloggers), your customers want to see YOU. Okay, let’s take a detour so I can make a long-winded analogy. Let’s say you’re trying to buy a vacuum on Amazon. You have two favorites. The first one has some product photos and makes lots of great claims about how powerful it is and how easy it is to empty. The second one doesn’t have a ton of photos or text, but the page has a video of the vacuum actually getting dirt out of the carpet, emptying into the trash super easily, and all around being a fully functional little vacuum. Which one are you going to trust to get the job done? Videos have the power to incite immediate trust. It shows that you are who you say you are. People are wired to build connections with other humans, and a video bridges the digital gap far easier than any other medium. Do you have to have a video? No. In fact, if you’ve never done video before, it’s better to start slowly by posting videos to your social media and seeing how people respond. Get experience. However, if you know you connect better with people “face to face” and can put together a semi-nice looking video, DO IT. Get the free About Page Prompts worksheet! What's the Difference between a Landing Page and a Homepage?